Home Advantages. Hardware Advantages. SW Series. SW Series light devices feature a compact form factor to provide pick-to-light error proofing in high-density applications with small pick face or parts bin locations. SW Series solves the challenge of applying pick-to-light to limited-space work areas. Common applications include picking small products or parts, such as washers, nuts, bolts and similar tiny pieces for spare parts or assembly kits. 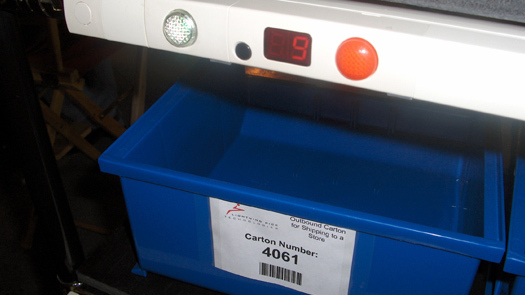 SW offers a model with no numeric display, and another that has a 3-digit quantity display. 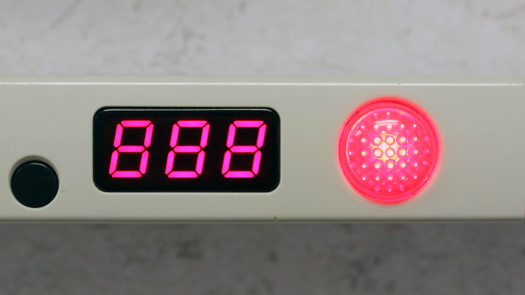 The bright round indicator light LED/task confirmation button is available in red or green. Easy Installation, Reconfiguration and Maintenance. 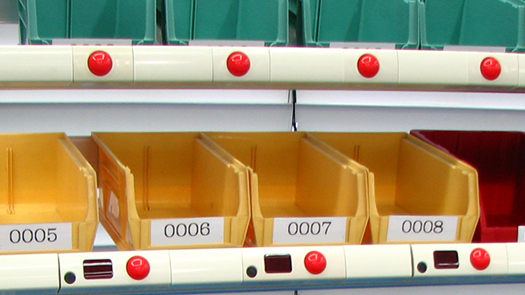 The unique SW duct system easily mounts on both curved and flat storage media surfaces. All power and data travel through the duct, allowing the devices operate independently for easy installation, reconfiguration, maintenance and replacement as needed. Compact SW lights are ideal for small pick faces on rack, shelves, workstations, bins or other high-density SKU areas. Domed LED light/task confirmation button available in red or green. Duct system mounts on flat shelf or pipe rack.